Beaton Accounting has been doing accounting work for businesses in Suffolk / Nassau County for 25 years. Over the years, Tom Beaton, the owner of Beaton Accounting, has developed a good knowledge of what Long Island businesses need to be more profitable. From complex tax returns to payroll issues, to the setup of new software, Tom has eased the pain of starting and running new businesses. He graduated from CW Post College in Brookville, NY with a Bachelor of Science in Accounting. Over the years, Tom has gained experience in Quickbooks®, taking numerous courses to educate him on current accounting issues. His latest venue is a network of hundreds of Quickbooks advisors and CPAs to help answer any questions that may arise. 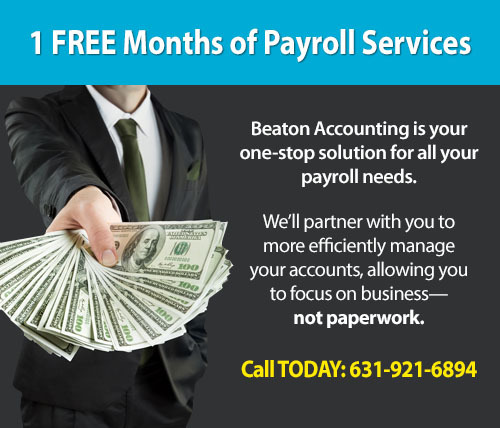 Recently, Beaton Accounting has found its niche in doing payroll for these Long Island businesses. Payroll is an integral part of business and payroll issues tend to be very time-consuming. Business owners simply don’t have the time or energy to keep up with it without losing focus on their most important issue – operating their business profitably. Whether it is in-house payroll or outsourced payroll, Beaton Accounting has the experience needed to help Long Island businesses prosper. From tax preparation to bookkeeping and auditing, Beaton Accounting has the professionals you need to ensure your company remains profitable and successful. Click here to read CEO Tom Beaton’s professional resume.